Drinkability: Almost a desert beer to be served after a meal. I could have two, but would be sipping them all night. Served cold, right off the Sun King Truck. Yes, I was the guy that showed up at the liqueur store right as the Sun King Truck pulled up Monday after my first day of my new job... A brief car ride home and popped it in the luxury of my own home. I think it would be creepy if I bought it and started drinking in front of the store... Like I said beer connoisseur, not alcoholic lush! Pours with a dark nearly brown in color body with ruby, crimson edges. Minimal head that quickly dissipates. Sound reminds me of that first bowl of Rice Crispies as a kid on Saturday mornings. All snap, crackle, and pop! Sweet malt cherry nose with a boozy bourbon character. Notes of brown sugar, molasses, wood, and dark fruits with light carbonation throughout. Other tasters noted vanilla as well but I didn't really taste/smell it. Finishes with a boosey bourbon taste. The sugar leaves the mouth with a coat of sweet tart cherry thickness that puckers the mouth slightly then dries out the mouth. Similar to a white wine finish in that respect. Serve Warm(er) if you want the bourbon boosieness to be more pronounced. I started a new job today.. 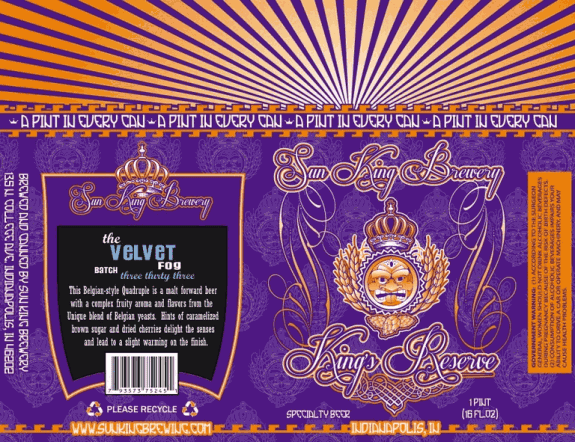 It just so happens "The Velvet Fog" graced the beer community of Indiana with its presence as well. Random Happenstance? I think NOT! I have been looking forward to this beer ever since I heard about it a few months ago. I am a self proclaimed Hopp-Head, Lambic/Sour, and Belgian guy and knew I should put this on the "to drink" list. It didn't disappoint. Professor Beer: Velvet Fog has strong dark fruit and bourbon flavors. Also has a warming at the end. Very smooth (The Big Guy beat me to the "velvety smooth" line, but it's definitely appropriate) and very complex, but balanced. This is definitely a beer I could drink a lot more of, if it wasn't so expensive and limited.